I take photos. I take a lot of photos. I take photos of people a lot. 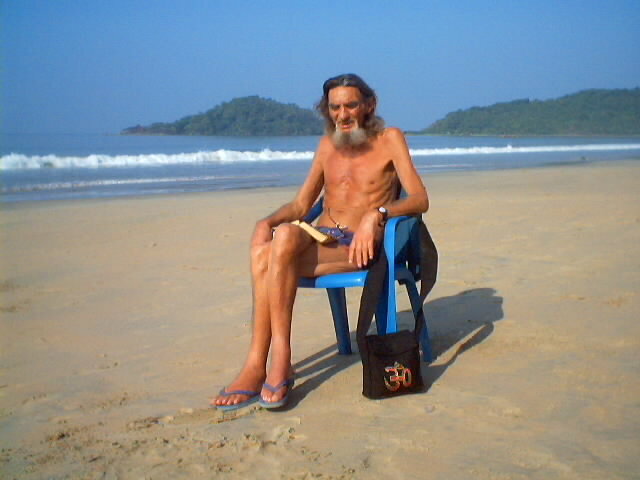 Yesterday I took a photo of Gabe the old hippie on the beach. It came out very good other then the fact it hard to see he is wearing clothes. He is very thin. The photo below was taken in the morning about 8:30. He is person with a routine. He wakes goes down to Flavias for cup of coffee. Sits and reads his book, and now he has added a sit on the beach in a plastic chair. At night He sort of wanders around and reads during the days, then watches the sunset. Blows his conch horn. Eats dinner and goes to bed. I told a Gabe last night. Now this is the curiosity part of this story. Phil has paid attention enough to me talking to know that I put a lot photos on the internet. He connected the dots and the possibility that I could put a photo of Gabe on the internet. This was bright and quick. Plus he was making a joke to such. What I do not understand is why there is no proactive curiosity. Why can I talk about taking a persons photo and no one goes and looks at the page to see what I am doing. To if someone said they was taking photos of me especially I would go and look on the internet and check it out. But strangely even if a person takes down my internet webpage address I know that there is only about a one in ten chance they will look at the page. There is a chance they will look at the page if I send them the link from an email. But to be curious enough to ask me for the address. “HoboTraveler.com” then tell them to click on BLOG at the top of the page. I meet a few people that have webpage. Most who have a free one like Geocities cannot remember the correct address. I meet business owner that have web sites and tell me the wrong address. This is weird to me. It is beyond my ability to understand how a person would not be curious enough to know exactly or learn specifically how to go to their own webpage. I understand a little more them having trouble going to my webpage, but to not be able to go their own is just baffling to me. What do they think about? Where are they in their mind? Are they lazy? I think about two types of activity in life. If I am sitting in and internet café and I have a photo of a friend on a page. I send this page to the friend and he or she opens the page. This is reactive. If I talk about page, then they write it down. Go and look at it later. This is proactive to me. I am not sure I understand exactly the meaning here, but this is what I mean I believe. It is that some happened or was learned “previous” and there is a call for action later. 2. Maybe writes it down or references in some way to remember what they learned. 3. Takes the information that has been recorded and acts on it at a later time. A project like writing a book takes that you react on the information over and over again in a chain of consistent day or periods. That you continue to focus on something without prompting. There is not reaction. It is proactive. To me in my opinion this sets us apart from the animals and maybe for a lot of people it does not separate us from the animals. An animal gets hungry and looks for food. That is probably reactive. There is suppose to be an instinctual drive to migrate or travel south for the winter in birds. This is difficult to grasp where this drive come from. What is instinct? I think the desire to have a baby in humans is instinctual. It is below the conscious level. We do it almost without choice, and it is inherited from family to family or person to person. This is instinctual behavior. But what happens to curiosity? Why are people not curious? I just thought about fear. A person will get real curious if they are afraid. This to me is more instinctual. Self preservation and survival. I can get a person to pay attention real well if they are afraid. Sort of a boot camp mentality. Push them real hard and punish them and they will bond with the other soldiers and learn real fast how to behave or what is expected of them. I would guess or I think that only about 1 in a 100 hundred have the ability to work on a project without fear involved. Some people have done projects for school, but they are afraid they will not pass the class. They may talk about this project they accomplished for the rest of their lives. I think about 1 in 50 can work on a project if they think they will get famous. I believe most actors have a obsessive, compulsive desire to become famous. I think it bridges on insanity. Same for the rock singers. Lots of people will read and stuff their brains full of information. This is learning and not a project. They pick up a book and get a tingle in their brain because they are happy. That is a chemical reaction. Sort of like bungee jumping but less intense. An endorphin rush. I think of people that like too much stimulation on a regular basis as endorphin junkies. This learning is not proactive. It is the desire to feel a feeling. To want to be happy or get the rush of the endorphins in the mind. 1. People that do things because they are afraid. 2. People that do things because they want to be famous. 3. People that need an endorphin rush or to feel good. No one is just one of these things. They are a little of all of them and mixed up in a barrel, and shaken. There is just no clear answer to anything. Always life if jumbled. I look at people as I travel. I try to see or learn what motivates them. Everyone is different but there is still little difference between a dog and a human. But then I do not consider the desire to be famous a high level of thought. I consider it just a huge endorphin rush. Most people put on clothes or take off their clothes to get a rush. They were a fashion to hope they feel good or people will comment on how beautiful they look. The more they get the rush of feeling good the better they feel. They are motivated to be famous. Wanting money is normally fear of not having money. Some want or are greedy so they can have more of that endorphin feeling. The more they have the more they can feel good. There are lots of traveler that will say. They need to go home and take photos so they can show their mate or friends. I think of that as just want to be famous. The sharing of something with a friend is nice, but not a reason to go on ones own. Return and drive your friend crazy with the photos. Better to really go together with a person and share the experience together. Like a husband and wife does in life, they share their lives. But to me, and forever I am curious about what separates us the human from the animal. I do not see a big difference. I really see almost no difference. The only time I see a real difference is when a person collects things over time like a hobby. They have a project that they do alone. That occupies a lot of time. That they must go and search for information on and they do it for years. This is a hobby or a project that goes for a long time. A lot of entrepreneur types work toward a goal for a long time. I cannot separate this from myself. I am just like anyone else. Sometime I want to be noticed or have people pay attention. Sometime I want to just feel good or get the endorphin rush of learning or doing something. Sometime I am afraid. Somewhere in that mess is my motivation for why I travel. But I am not sure where and I am not sure I care why. I think in the end. I am happier traveling then I am sitting at home working. So if I can work and travel life is good. I work on the web pages like a hobby. I try to keep the think organized and in shape. Pruning, cleaning and organizing with the hope that some day this garden called a web site will be beautiful and wonderful to enjoy. But I am also afraid. I want to have money so I can live and retire and do nothing. If I work on the pages long enough I can have enough money to live anywhere and enjoy life. To be able to live life as I wish totally. Not controlled by location, or situation or another person is my goal of the webpage. To have enough money from the webpage that I am not dependent on anything to live. This could be fear. I suppose I am afraid also of people letting me down or commitment. But all these fears, wants, and desires to have them endorphin rushes are what makes us or me human. Maybe I am a human or maybe I am just an animal? 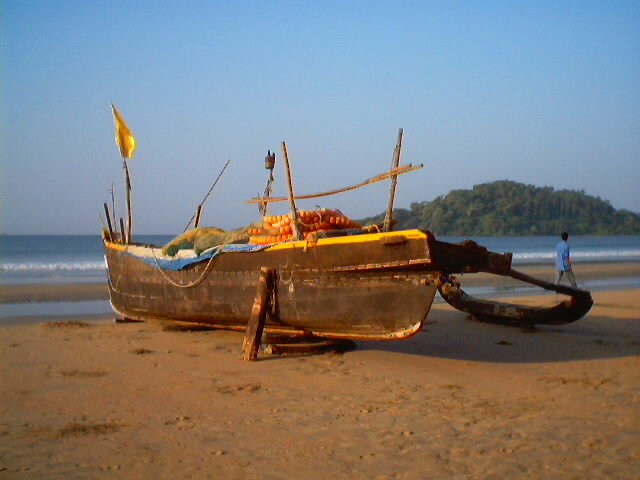 Fishing boat on Palolem Beach in Goa, India. They net fish.